by Cara Harshman, Optimizely Inc.
Twitter is social media’s conversation hub. Chatterboxes and lurkers can harness the platform to share — and absorb — a wealth of information in record-breaking time. In 140 characters (or less) marketers are empowered to share compelling, stories. In this post, we’ll cover 5 critical techniques for making the most out of these valuable conversion opportunities. For 5 more, download this guide to 10 Experiments to Help Increase Value from Social Media. Let’s get to it. The ROI of social media is far from straightforward. The fact is that audiences aren’t necessarily in the mood to shop when they’re checking Twitter from their phones — or during brain breaks on boring conference calls. To accurately capture the value of social media, marketers need to look beyond direct sales opportunities. Conversations are a critical step to driving sales, which is why your brand should focus on quantifying natural, social behaviors — 76% of respondents in the Twitter/DB5 survey say that they’ve tweeted directly at a small business. Month-over-Month Follower Growth — This metric will help you quantify your brand’s word-of-mouth presence and influence. Twitter visitor to lead rate — This metric will help you ensure that you’re steering the conversation on a path towards sales. Web traffic to blog content — Content marketing can help audiences discover your brand, and Twitter is an invaluable channel for getting them there. This metric will help you optimize that traffic flow. Optimization starts with laser-focus on a precise set of goals. Small businesses don’t have the flexibility to throw darts in the dark. Choose to optimize metrics that are most aligned with long-term sales goals. Twitter states that they see 2x engagement on posts with images. Test whether a specific type of image creates more engagement over another. Instead of specific images, test out the impact of different image types, like images with people versus no people. Models versus just product. Test the impact different images have on different social networks. What drives shares and likes on Facebook may not perform as well on Twitter. Running a small business, you probably have a close connection with your customer base. If you’re brainstorming ideas for images, then interview a few of your key shoppers. What value proposition resonates with them? What compels them to buy? The answers to these questions can help your marketing team craft high-impact experiments. You can come up with a way to quantify success by categorizing images based on qualitative traits. Track how each of these categories affect the performance goals from Tip #1. There is no consensus in the world of social media about the time of day or day of the week a post will reach maximum exposure. Your audience is unique, so there’s no way to standardize times of days for tweets to be shared. When in doubt, test relentlessly. Dan Zarella, social media scientist at HubSpot, is a champion of this commitment to testing. 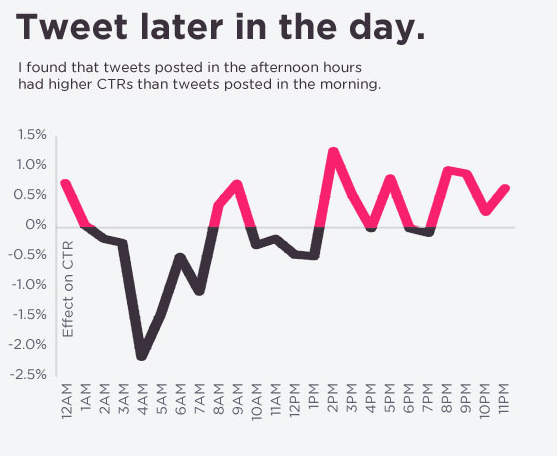 He did a study that found afternoon Tweets had higher click-through-rates. 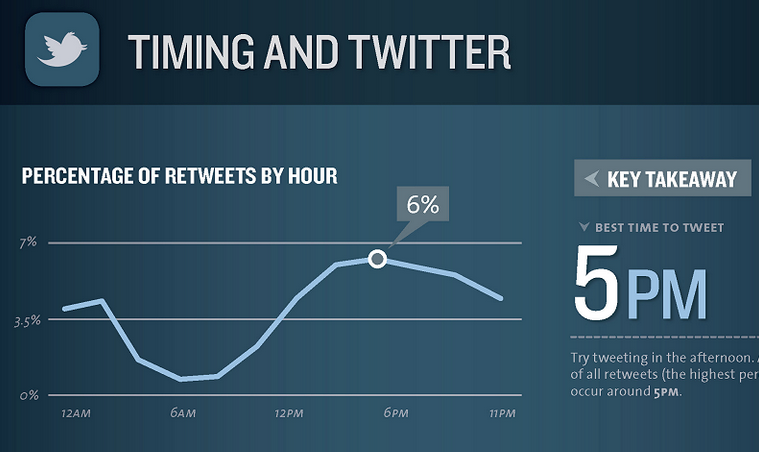 In another study, he found that the best time to Tweet for retweets is at 5pm. We expect web traffic from Twitter to peak at 8AM because followers are likely commuting to work. Conversions from Twitter will likely peak at 6:30PM because audiences will be finished with work and will have the attention to devote to learning more about a brand. Many SMB-friendly social media measurement tools like Sprout Social and Buffer will track timing for you. If you don’t use one, then you can use unique URLs based on the time of day. You can track these unique URLs with your analytics software. Language and length are two factors that go into crafting a call to action in a social post. Testing how you position an action is a way to gauge what interests your audience. Run a controlled campaign for a few weeks on each of your main channels and track how the usage of direct CTAs vs. absence of CTAs impacts engagement. You may find, for instance, that audiences are equally interested in “re-tweeting” or “learning.” Take a look at how these varying CTAs impact the goals that you identified in Tip #1. 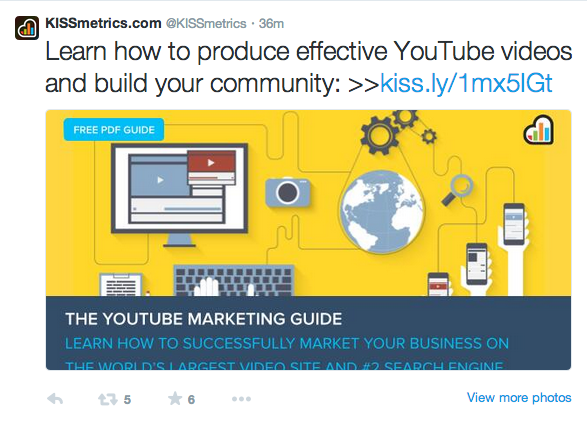 KISSmetrics tells people directly to “learn more”. The arrows to the link add emphasis on the link. CTAs are invaluable tools for small businesses. Testing will help you figure out what your ‘ask’ should be. The competition for audience attention is fierce, with Tweets yielding a notoriously short shelf life. Promoted tweets can help increase the lifespan and reach of a Tweet that may otherwise remain unnoticed. As a small business owner, however, you don’t have infinite ‘branding’ resources to test. You need to make every invested dollar account — otherwise, your PPC budget may slip through your fingertips. Even if you’re tweeting the world’s most awesome message, you need so make sure that you’re reaching the right audience. Which groups are likely to be the most receptive and engaged? When in doubt, test some potential answers to this question. 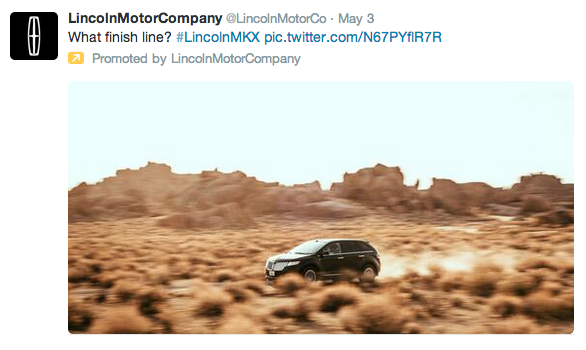 Here’s an example of a promoted Tweet from Lincoln Motor Company that is targeted to people searching for “Audi”. Promote the same update to different audiences and measure which ad has the best engagement. Make sure your audience experimentation is controlled. Change one filter at a time to see if/how that difference in audience impacts success of your campaign. You can even test different ad variations (i.e. image and text) to see which ones generate the highest response levels. On social platforms, click-through rate can be heavily influenced by images. 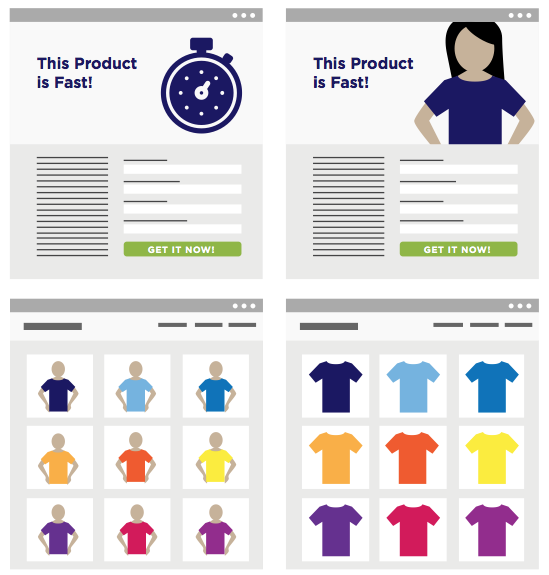 Test different/contrasting colors, people vs. products, male vs. female images. Test to your heart’s content, and keep track of how audiences respond. We’ve shared an initial list of five optimization ideas for driving Twitter conversions. You can find 5 more in our guide, 10 Experiments to Help Increase Value from Social Media.